I read this forum since few month, it’s a incredible source to build a foil board! I’m french (coucou aux francais!) but I live in Detroit in Michigan. So as you expect, I’m here because I would like to build an E-foil board. E-surfboard, but to do what? I like speed, sport, jump… cruising at 15 mph is not really my idea of my board. E-board are good for that and they are not really different in technology. So i would like to study the possibility to create a board with 2 position for the motor, one in the foil, one attach to the board… both with propeller. The motor, ESC, propeller and battery type need to be the same. Probably in no foil, have a higher voltage/Amp battery pack, to have more power could be nice. I will probably go for a 10kw motor direct drive, to have around 6Kw in foil, and full power in board. Battery pack of 6S 12C 20 AH, 2 in foil (44V), 3 in a board (66V), maybe need 4 to have 88V? Everything it’s quit clear for my board except… The propeller of course! Small propeller with high RPM (15000/20000) or a bigger one with low RPM (5-6000)…? Thank you very much for this forum! 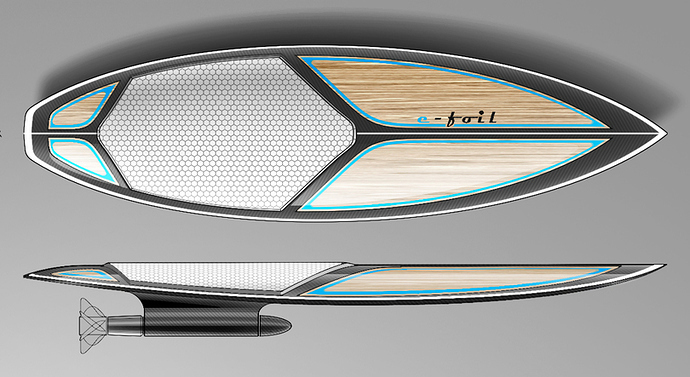 There is a guy in my local hackerspace that is building a hybrid that can be an efoil or jet surfboard. Really seems like two different categories of RPM levels, but we’ll see what the final result shows! An interesting project, but a lot of work is waiting for you. 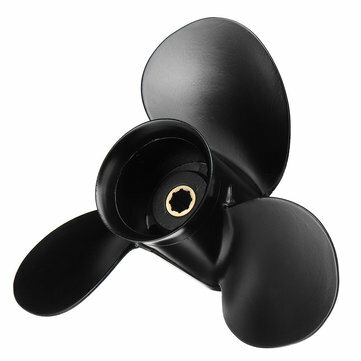 Finally, you’ll need a high-quality propeller that can’t be bought anywhere and can not be seen anywhere. Necessary features of the propeller: steel, aluminum, carbon or titanium, pipes to protect, maximum efficiency (correct shape and number of blades). Maybe I can help you model such a propeller and pipeline in 3D CAD, measure efficiency and static thrust. Yes the power for both configuration are different, but it’s easy to manage with the number of battery to change the voltage. The propeller is the pain point ( like always in general in this kind of project). I have access to a 3D printer to make some custom propeller. And one of my friend can cast it in more or less every metal. So yes if you can help me to define it could be really helpfull. I also use the Vicprop calculator to define the general capacities of the propeller. With a 10 000rpm 10hp motor in direct drive, it give me a tehorical speed capacity of 75km/h with a 4 inch propeller with 6.2 pich, 3 blades. Of course it’s the thoerie, so in real life I can expect a speed around 50/60 km/h. One other pain point in foil is the turn capacities, I never seen a foil make short curve, if I understand correctly the wing loose the lift when people try to make a short curve turn… With the current wing shape it.s nearly impossible to take to much angle during the turn without loosing the lift. Anyway, I will develop the prop system with the rocket directly attach to the board, it’s the configuration who ask the most power. If I can have enough for the board It will be more than enough for the foil. I have access to a 3D printer to make some custom propeller. You should print such a propeller on a 3D printer first from plastic. Preferably on an SLA or DLP printer. Then measure its effectiveness. If the efficiency is sufficient, then print it out of the metal. I can measure the efficiency of the propeller, I have professional equipment for it. For the propeller I think in the begining I will try different version of some we can find in the shop, some of them are really cheap and it could give me an idea of which kind of propeller work better. I can also reduce the diameter if needed, to find the right balance and cruising RPM/propeller. Also, some shop propose to try different propeller for free. Traditional construction, Foam/ carbon fiber, with some wood insert (probably fake for weight). The board will be quit big, to have a low planning speed, and I would keep the board floating when I’m stop. The motor will be direct cooling, I’ll using it in lake so it’s not to hard for the motor compare to salt water. The ESC will be in the rocket, to keep a natural flow cooling and don’t have additional pump for this. -first I will probably go for 3 pack of 20000mAh 6S 12C battery, to have 66V to the motor, I can adjust the power if needed. -For the motor I think the APS 100100 INRUNNER BRUSHLESS MOTOR 100KV 10000W from Alien Power could be a nice option. Really interesting, but in the video, lot of part are accelerate, so it’s hard to see the real speed. I think the it’s quit slow, the propeller is really small with low pitch, no miracle the pitch is the key to have speed… The trouble it’s to find the right balance acceleration/speed. For the foil wing I will probably go for the composite crasyfoil, in custom mast and fuselage. Same they are cheap, simple, so nice for reference. I trust you, it’s just hard to see in a video. But I would like to keep a marge of evolution, at the beginning 44V (4400Rpm) will be probably enough, but when I will be more confortable with it I would like to keep the possibility to go faster if I want… Or not. For all of this setup it give me a speed of 43.6 Knot. For the video 13hp and 6900RPm , the best propeller in this website will be a 5.2X10.7 (132X271mm) for maximum speed of 49 Knot. (90Km/H)… it’ could be a race board! So I’ll probably go first with a cheap 9X10 propeller and reduce the diameter to 6, it will give me reference, after I will reduce the diameter until the motor is in the good range. 50$ it’s not a huge investment. The website is theory, so yeah, maybe it will not working, but the idea it’s just to have a reference, and this calculator is a good starting point. I enter on the calculator 10Hp gas engine, so 7 KW… and in general for torque electric is better than petrol engine, but maybe I’m wrong for this kind of small engine. Gearbox will give me more torque for sure… I’m still struggling between direct drive or geared. It’s the reason why I will start with the board, to let me the time to define my power unit.